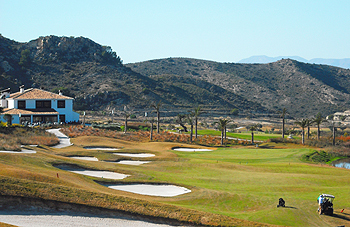 Designed by Blake Stirling and Marco Martin, the course at the Font del Llop Golf Resort lies 15 miles inland from Alicante airport and it’s part of an ambitious residential development which saw the golfing component of the project come to life in the summer of 2010. Fairways nestle within a steep-sided valley and holes blend beautifully into a landscape, where a small river (once used in local beer production) runs through the course, linking a handful of small irrigation ponds that occasionally come into play. The front nine at Font del Llop (translated from Spanish as “Wolf’s watering hole”) culminates in a long, gently uphill par five and its teasing split fairway lies on either side of a water hazard that threatens the length of the hole from tee to green. Feature holes on the back nine include back-to-back par threes at the 16th and 17th, with each of these “short holes” measuring almost two hundred metres from the back tees. I played the course on January 2nd, 2015, and I can testify that this course will stand the test of winter with high colors. It was a very nice day, but still wintery (i.e., the sun shone but the temperature never reached 20°C). The condition of the course was immaculate, the design is most pleasant if a little unreal as the hills looking onto the course were much barer and stonier than the lush fairways and rough. If the maintenance keeps up at this high level, I have no doubt that this club will achieve top position in the region. What a gem. We stumbled upon this course almost by accident, due to its proximity to Alicante airport, and were pleasantly surprised. The course has echoes of Finca Cortesin, on a smaller scale, in that it plays through a valley with spectacular views, tee shots across ravines and no housing in sight.The 9th hole is an absolute beast, a long uphill par 5 where you drive over a lake, must carefully position your second shot to avoid a stream which runs down the middle of the fairway, and then hit an uphill approach to a tricky elevated green ringed by bunkers. The other par fives offer a bit of respite and are in range with 2 well struck shots. 16 and 17 are a little odd: back to back par 3s running parallel at the top of the course, it feels like they ran out of room.The 18th is a wonderfully strategic finishing hole: a long straight downhill par 5 with out of bounds all the way down the left, and a lake on the right side from 150 yards out right up to the green. It features a cluster of bunkers at driving distance on the left hand side which encourages you to drive down the right where there is plenty of room. But a safe drive down the right lengthens the hole and requires you to play your approach over the lake. A more aggressive line down the left brings OOB and bunkers into play but gives you a shorter approach that doesn’t have to carry the water. What did I do? I aimed my drive down the middle but tugged it slightly left, flirting with the bunkers my ball kicked forward off the down slope and left me 175 yards in. An arrow like 6 iron followed, my eagle attempt lipped out, but I tapped in for birdie and walked off with a big smile on my face! A very good course indeed. Many excellent holes in an interesting and challenging layout. The greens were in good condition, the fairways OK. The situation is attractive. It looks as if Font de Llop was meant to be the centrepiece of a very large development, but I suspect that the money ran out, so there is no housing around the course.The front 9 and the last three holes are varied and quite tough. If you were being picky, the first few holes on the back 9 are a bit up and down, but we liked the course a lot. We were welcomed warmly in the pro shop, but the bar restaurant was really ordinary. It should be played if you are anywhere near. I first played the course in the year that it opened (2010) and knowing the courses around region well, Font del Llop is a welcome addition and has a real chance to become first choice for visiting golfers. Already there is a nice feel around the clubhouse and the design of the holes is noticeable for the right reasons – there is a look and feel here that reminded me of a smaller version of Finca Cortesin (a few hundred km’s down the Spanish coast) in that the course has been built in and around the natural rugged land without too much change. The opening two holes at Font del Llop are a little similar in the fact that they are dog-legs to the right with the second a little longer in length (both are ideal for the fade from the tee). There is a tough tee shot at the par-5 5th with anything left likely to end up in no-mans land. The 7th is one of those short par-4’s that are normally a joy to play, this is too but with eight bunkers within 100 yards of the green, a four still has to be worked for. The strongest hole on the front-9 is the 9th – a tough par-5 with water in play from start to finish; the lake near the tee narrows eventually to a stream and is in play on every shot to the green – add in a tricky sloping green and this is a memorable hole. There a couple of par-3’s over water on the course, with the pick of them coming at the 12th. My thoughts overall of the back nine are mixed - I liked it in places but for me there is a negative at the 16th and 17th …. these are back-to-back par-3’s running parallel with each other on the only part of the course that looks dis-jointed to the rest. You will need to play it to see what I mean I think. All faith is restored at the 18th hole – a brilliant par-5, heavily bunkered on the left-side and water back in play for the last 150 yards down the right and at the green. Drinks on the terrace over looking the 18th green is a must to end your time at Font del Llop - For now the course is a decent 4-ball rating – there is scope though to become a 5-ball I think as the course matures.